Members are recognizable by the wearing of our official badge. 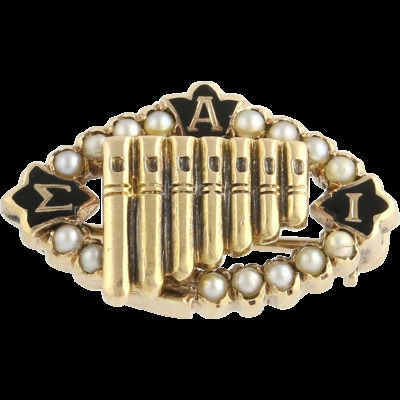 The regulation badge has the seven gold Pipes of Pan encircled by a band set with pearls bearing the Greek letters "Sigma," "Alpha," "Iota" on black enamel. It is a shield of gold, with the middle third of crimson. In the center is a sword lying in an open book; at the top right a white rose, and at the left a red rose. Above the bar of alternate gold and crimson is a green wreath encircling gold Pipes of Pan. 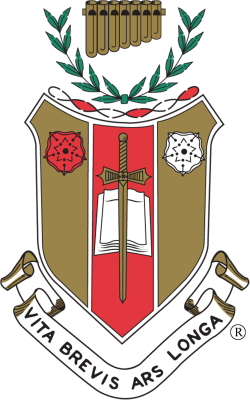 Below the shield is a scroll containing the open motto of the fraternity, "Vita Brevis, Ars Longa" (Life is short, but Art is long). We have several public symbols that are used to recognize us nationally, however their meanings are secret and sacred to us. These include ours colors, crimson and white, the red rose, and the Pipes of Pan.